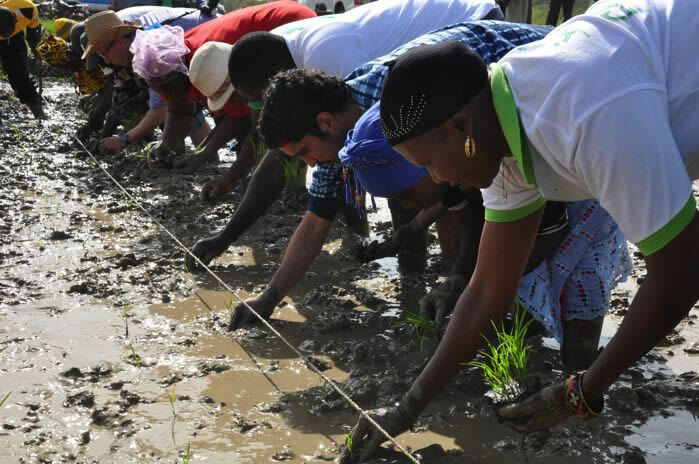 'Improving and Scaling up the System of Rice Intensification in West Africa' (SRI-WAAPP) is the 3-year first phase of a regional World Bank-financed project to increase rice productivity throughout a 13-country Economic Community of West African States (ECOWAS) project area. The project, which is being implemented January 2014 - June 2016, is part of the larger West Africa Agricultural Productivity Program (WAAPP). A map (right) of the SRI-WAAPP project field sites as of 2016 gives an overview of where SRI activities are ongoing and the type of rice system prevalent there. The origins of the SRI-WAAPP project can be traced back to growing demands for technical and training assistance in SRI from within the 13 project countries, leading to an initial regional workshop, held in Ouagadougou, Burkina Faso in July 2012. Demand for a regional project grew out of the Ouagadougou workshop, resulting in a proposal that was submitted to the West and Central African Council for Agricultural Research and Development (CORAF), which manages the WAAPP on a regional level. In August 2013 a planning workshop was held in Saly, Senegal, and in February 2014 the project was officially launched with a workshop in Porto Novo, Benin. 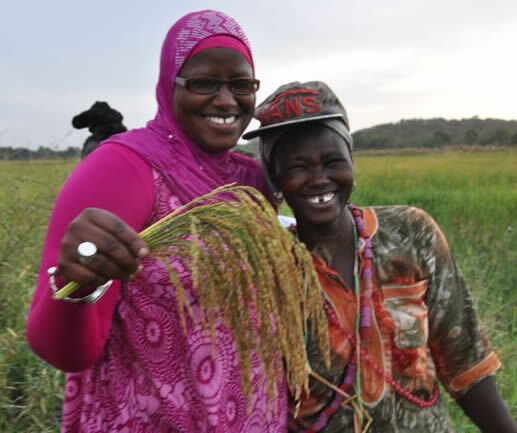 The project’s Regional Coordination Unit is formed from a partnership between Mali’s National Center of Specialization in Rice (CNS-Riz), based at the Institute d’Economie Rural (IER) and acting as the project’s lead organization, and the SRI International Network and Resources Center (SRI-Rice) at Cornell University in Ithaca York, being the technical and strategic partner. Dr. Gaoussou Traoré (CNS-Riz) (far right in photo) is the project’s Regional Coordinator, Dr. Erika Styger (SRI-Rice) (far left) is Cornell’s principal investigator, and Devon Jenkins (SRI-Rice) is the technical specialist. SRI-Rice provides technical backstopping and trainings, set up the monitoring and evaluation system, produces technical materials in English and French, maintains the SRI-WAAPP project website, with English and French versions, and facilitates a regional (public) Facebook page. Beginning in 2001, small-scale trials were conducted with SRI methods in Benin, Burkina Faso, The Gambia, Guinea, Senegal, Sierra Leone and Togo, undertaken by individual farmers or technicians and by some projects associated with USAID, FAO and numerous NGOs such as ECHO, Africare, CRS and World Vision. These trials confirmed the high yield potential across the region, with yields reaching 7.5 t/ha and even 11 t/ha, compared to conventional rice farming with 2 - 5 t/ha. Nonetheless, the initiatives remained at local level and did not find much traction and expansion. This changed after the NGO Africare, in collaboration with the Ministry of Agriculture, obtained very good results in 2007 testing SRI with one farmer (reaching a yield of 9 t/ha with SRI compared to 6.7 t/ha with conventional rice) and the farming community requested further testing. Africare then undertook an in-depth evaluation in 2008 in Timbuktu with 60 farmers in 12 villages with funding from Jim Carrey's Better U Foundation. Average SRI yields from all farmers reached 9.1t/ha, with a range from 5.4 t/ha to 12.4 t/ha. On average SRI yields were 66% higher compared to the control plots with 5.49 t/ha and 87% higher compared to the surrounding rice fields with 4.86 t/ha. Although production costs per hectare were slightly higher for SRI – 15% and 25% compared to the control and farmer practice plots, respectively – SRI revenues were 2.1 and 2.4 times higher. (See report for details.) 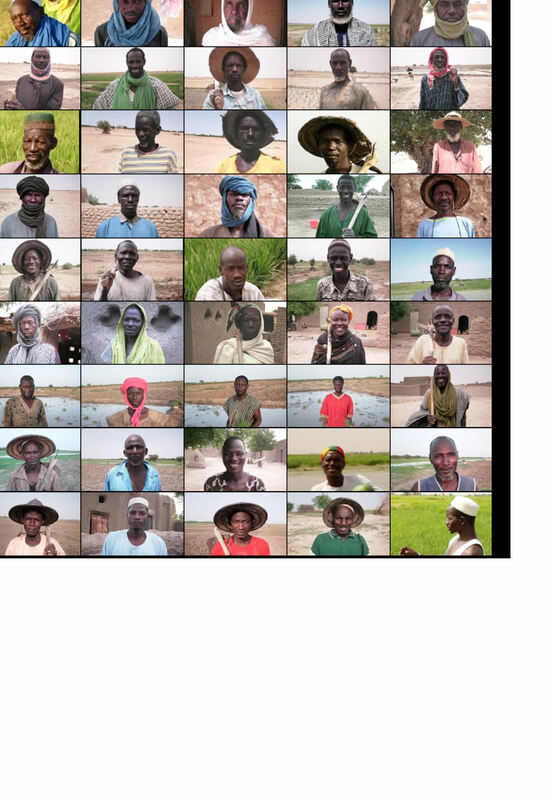 To follow the farmers through the cropping season, visit Erika Styger's SRI Timbuktu Blog. The success of this first SRI initiative in Mali sparked the interest of other projects and donors in the country. New SRI projects started in 2009 with the USAID-funded Integrated Initiatives for Economic Growth project (IICEM) which introduced SRI to the Gao, Mopti and Sikasso regions, and to new areas in Timbuktu not covered by Africare, working in total with 118 farmers in 21 villages (see report) while Africare expanded its reach in Timbuktu working with 270 farmers in 28 villages. Funded by the Syngenta Foundation for Sustainable Agriculture, researchers from the Institute d’Economie Rurale (IER) established field trials in the Office du Niger area in the Segou region, and Konna in the Mopti region in 2009 and 2010. The World Bank also started to support SRI technical exchanges in 2010, organizing two video-conferences in Mali in collaboration with the World Bank Institute in Washington DC, connecting researchers, farmers and technicians from Mali with SRI experts in India and Madagascar. The World Bank in Mali also integrated SRI as one of the sustainable agricultural practices to be promoted in its agricultural project PAPAM (Projet d’Amélioration de la Productivité de l’Agriculture au Mali). Based on this rapid expansion and solid successes in at least 51 villages across 5 regions of Mali, the various program implementers and the Ministry of Agriculture organized the first National Workshop on SRI in February 2010, where experiences and field results were shared. It was at this national workshop where the rice program leader of the regional project Expanding Agribusiness and Trade Promotion (E-ATP), funded by USAID, learned about SRI and saw the opportunity to build on the Mali success story and work with IICEM to undertake regional outreach. In August 2010 the two projects organized a knowledge-exchange and training workshop in Mali, inviting representatives from 7 countries – Benin, Burkina Faso, Côte d'Ivoire, Ghana, Nigeria, Senegal and Togo. This workshop was followed by in-country trainings of trainers workshops in Benin, Ghana, Nigeria,Senegal and Togo in 2011 and 2012. It was through the accumulation of all the above activities that SRI became more regionally anchored and widely known. At the same time, an increasing number of organizations and interested individuals from West Africa contacted SRI-Rice at Cornell University looking for information and training opportunities. SRI-Rice participated in the first West African ECHO conference in October 2010, held in Burkina Faso, introducing more stakeholders in West Africa to SRI and where the initial idea of developing a regional network was put forward. In early 2012, discussions between SRI-Rice and CNS-Riz at IER (Mali) were initiated on how to expand SRI across the region. The World Bank supported the idea and in a meeting with representatives from Ghana and Senegal, the World Bank, CORAF/WECARD, CNS-Riz and SRI-Rice it was decided to organize a regional meeting to discuss the possibility of developing a commissioned regional project for SRI. In July 2012, more than 60 participants representing i) research organizations, ii) extension services and iii) civil society from 13 West African countries attended the Ouagadougou workshop (see photo album at right). Oxfam sponsored the participation of civil society through a grant managed by the NGO SRI Global, Inc. This conference identified and agreed on the framework to develop a project proposal for scaling up SRI in West Africa, and established a task force for writing the proposal (see ChronicleOnline article, PowerPoint presentations from the workshop, and video interviews with participants). The SRI-WAAPP project utilizes a novel structure, combining the existing WAAPP program – which has country-level administrations and budgets responsible for carrying out work across a broad spectrum of agricultural and animal production sectors – with a regional coordination and country-level actors working outside the formal framework of the WAAPP. A National Facilitation Institution is designated for each country, along with a National Facilitator, independent from the WAAPP and be based either with an NGO, the Ministry of Agriculture or the national research institute, who works closely with the national WAAPP structure to implement SRI activities within the country. The National Facilitator is also responsible for coordinating and keeping track of all other non-WAAPP SRI activities in their country. In addition to the country WAAPP structure and the National Facilitator, each country has a non-fixed number of ‘SRI Champions’ – individuals from diverse backgrounds and affiliations (technicians, farmers, NGO representatives, etc.) who have emerged as leaders undertaking SRI activities in the field, and are able to attend national and regional SRI-WAAPP events and activities. Since the project officially launched with the February 2014 workshop in Porto Novo, Benin, a series of additional workshops have been held for planning, review, communications and training purposes. Cotonou M&E and baseline methodology workshops – Following the Abidjan workshop, two back-to-back sessions were held in Cotonou, Benin, to validate baseline study terms of reference, and introduce and provide training on a new digital / mobile data collection option for countries using Survey123 and ArcGIS Online. (See report for the baseline study session (PDF, 11 pages – in French) and the report for the new data collection platform training session (PDF, 9 pages). Dakar M&E technical workshop – During the data collection platform training session in Cotonou (see previous bullet point), participants interested and demand in the platform necessitated a follow-up training to go more in-depth into the tools presented, resulting in this workshop / training in Dakar, Senegal in August 2015. The full report is available here. Côte d’Ivoire and Senegal support visits (February 2015) – In conjunction with the February 2014 regional workshop in Abidjan, SRI-Rice’s Dr. Erika Styger and Devon Jenkins collaborated with local partners and CNS-Riz to organize and lead a national SRI training of trainers in Yamoussoukro. After this training Devon continued on to Senegal for a support visit that included meetings in Dakar, Ziguinchor and Matam, and SRI trainings of trainers in Ziguinchor and Toubacouta. (See full Senegal trip report). Senegal and The Gambia support visits (December 2015) – After the December 2015 Dakar workshop, SRI-Rice’s Dr. Erika Styger and Devon Jenkins, alongside members of CNS-Riz, visited with the project’s overseeing organization, CORAF, at their headquarters in Dakar, then flew to The Gambia for a technical support visit. 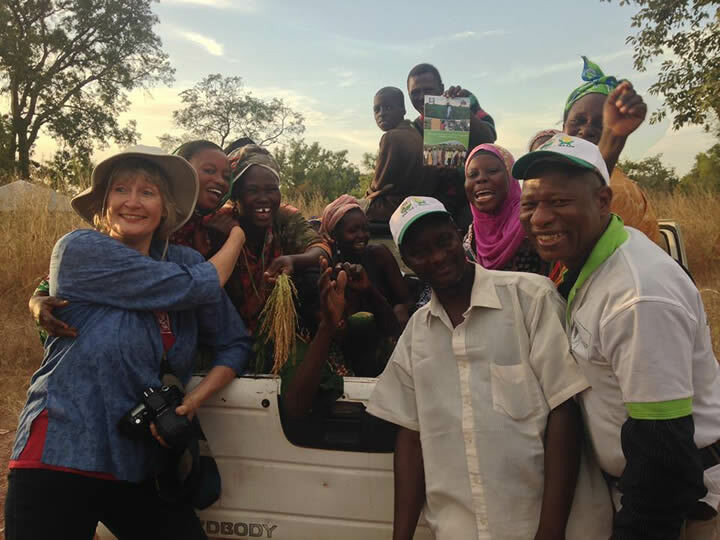 In The Gambia the team met with WAAPP and government officials and Peace Corps, before conducting farmer and field visits in the Central River Region, and national SRI training of trainers at the Sapu Agricultural Research Station. 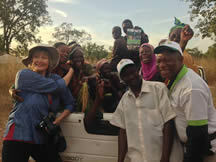 (See full report for both the Senegalese and Gambian portions of the trip).